This is a quintessential Canadian novel. No one from outside Canada could have written it. Probably it also takes having set foot in Western Canadian to fully appreciate it. And if you ever thought Canadian art and literature are second-rate (as I had, idiot that I was), think again.The narrative is structured after Native American myths and Western settler folklores. The language is stern, spacious, sparce--much like the unforgiving landscape of the Canadian Rockies that it describes. The main character is ostensibly Tay John, the messianic halfbred of the title, but the one true center is the Mountains. Tay John, whose name is but a corrupted version of a mountain pass that still bears that name today, is just a part of the setting, an extension of the alpine character, where snow doesn't fall but flies, where time is measured in seasons but years are measured in the length of railway tracks.It is a pity that, while magical realism has become very much mainstream, this mythic realism has not caught any momentum outside the occasional Canadian literature class. Those who read Tay John are unlikely to find a large group of readers with whom to share the experience--but the solitary experience itself is sure to be as unforgettable as a solitary hike out into the mountains of Jasper. Tay John is one of those rare novels that compels us to read it over & over in order to appreciate its layers of complexity, beauty, and truth. Howard O'Hagan has written the most under appreciated novel in Canadian literature.I loved the story structure & how O'Hagan uses multiple narrative perspectives to paint a tragic and beautiful portrayal of a mythic hero struggling to find his identity amidst the swirling forces of western colonialism. Loved the Canadian content. Some very rich characters. I read this in University for an English class. 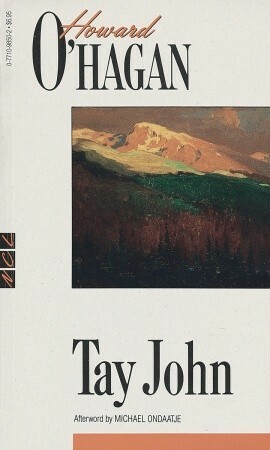 It was an easy read about Tay John and how he explored Western Canada. Descriptive and repetitive. Interesting characters and situations take place. It was alright, easy to read for sure. The author has a lot of repetitive language and I dislike how the women seem to lack voice. I usually enjoy native tall tales, but this one is too dry and one-dimensional for me. Pretty interesting. Mythical realism. Lot of symbolism and the story doesn't seem to be about Tay John but in fact about all the narrators telling the story.